This Sunday, face to face with Donald Trump. Are we on a reality show now? This is not reality, this is the real deal. My interview with the man leading the polls, on birtherism, ISIS, and his plan on illegal immigration. It'll work out so well. You will be so happy. In four years, you're going to be interviewing me, and you're going to say, "What a good job you've done, President Trump." All of it has led to talk of Joe Biden and the rise of this man: Senator Bernie Sanders. He joins me live. And finally, how much fried food can you get for 50 bucks at the Iowa State Fair? It turns out, way too much. Joining me for insight and analysis this morning are Jeff Greenfield, contributor to The Daily Beast, Molly Ball of The Atlantic, Kimberley Strassel of The Wall Street Journal, and Eugene Robinson, of The Washington Post. Welcome to Sunday, it's Meet the Press. Good Sunday morning. When he first began talking about running for president, a lot of people dismissed him, including myself. But there's no denying that Donald Trump has completely shaken up the Republican race. Topping national and state polls, drawing 24 million people to the GOP debate, and simply dominating the coverage so far. I caught up with Trump yesterday in Des Moines, Iowa for his first face-to-face Sunday morning interview as a candidate. I wanted this interview to be less about personality and more about substance. We touched on a lot of issues, birtherism, abortion, ISIS, immigration, Ronald Reagan, and much more. So let's get right to it, starting with his standing with the conservative movement. Some of the criticism on you from conservatives is you're not a real conservative. When you hear that-- You know, someone will argue on social policies that you're not a real conservative. Is it just different brands of conservatism that's out there and you just have a different brand? Or do you think they have a point? Well, I think they have a point from years ago. But they also have that same point with Ronald Reagan, who was a Democrat absolutely with a liberal bent. And Ronald Reagan became, you know, not only a Republican but a pretty conservative Repub-- not the most. But a pretty conservative Republican. And he's somebody that I actually knew and liked. And he liked me. And I worked with him and helped him. But I think that when you get right down to it, people do evolve on different issues. And, you know, I'm pro-life. And I was begrudgingly the other way. But I have to say when those questions were asked, and that was many, many years ago, I wasn't a politician. Should some form of abortion always be legal? You said life of the mother. What about health of the mother? Well, I said actually if the mother's close to death. And I'm talking about death. You know, because then you sort of say, like, "Well, maybe she's not feeling so well--"
Right. My statement on that happens to be, you know, if the mother will die. And you're going to know that. And the problem with the life: If you say life, what does life mean? You have a cold and you're going to end up having an abortion. So I have the three exceptions and pretty much the standard three exceptions that many Republicans have. It wouldn't have surprised you if you had? Well, it could be. Look, Planned Parenthood has to stop with the abortions. A lot of people consider it an abortion clinic. I think those tapes that I saw over the last-- the five tapes or the six tapes, I think they were outrageous. I think they were terrible, disgusting by any standpoint. And they have to stop. I mean, it was terrible. And in particular, I didn't like the attitude of the people. They talked about it almost like we're making widgets or gadgets. And it was inappropriate. But would you shut down the government over this dispute? I would not fund if they're doing abortions. But as you know, there could be a stalemate in Congress. Is it worth shutting down the government over? It's something I'd have to think about to be honest with you. I don't want to give a hard and fast answer to that. It bothers me greatly that they're doing the abortions. At the same time, women's health issues are, you know, very important to me. Let's go foreign affairs. You want to knock the hell out of ISIS. How? It's going to take ground troops. So America should take over these oil fields. Shouldn't be given to the Iraqis? Well, we can give them something. But we should definitely take back money for our soldiers. We've had soldiers that were decimated, so badly hurt, the wounded warriors, and killed of course. But we've had soldiers that were so badly hurt and killed. I want their families to get something. Because we got nothing out of that war. We spent $2 trillion, Chuck. We had thousands of people killed. Wounded warriors all over the place. They got nothing. And they can't even say we had a victory. Who do you talk to for military advice right now? You mean Colonel Jack Jacobs? You wrote this in 2011 about Saudi Arabia. "It's the world's biggest funder of terrorism. Saudi Arabia funnels our petro dollars, our very own money, to fund the terrorists that seek to destroy our people while the Saudis rely on us to protect them." What are U.S.-Saudi relations going to look like under a Trump administration? A lot. But nothing compared to what we spent. Nothing compared to what we spent. And I'll never forget shortly after the war the Kuwaiti fund came to see me. And they wanted to do a deal. And I said, "We have a great deal in the United States." They go, "No, no, no. Not United States. Not United States. We don't want to invest in United States." We gave them back their country. But to go back to Saudi Arabia, if they're a funder of terrorists, why should we have diplomatic relations with them at all? The primary reason we are with Saudi Arabia is because we need the oil. Now, we don't need the oil so much. And if we let our people really go, we wouldn't need the oil at all. And we could let everybody else fight it out. Look, Saudi Arabia is going to be in big trouble pretty soon. And they're going to need help. Because if you look at Yemen and you look at that border, you don't have to be an expert to know that is one long border. And they're not going in for Yemen. They're going in for the oil. They're going in for Saudi Arabia. So Saudi Arabia is going to need help. Like it or don't like it, people have backed Saudi Arabia. What I really mind though is we back it at tremendous expense. We get nothing for it. And they're making a billion dollars a day. --military into a mercenary force. No, not at all. Look, we are a debtor nation. We owe, I mean, now it's 1.9 trillion, okay? I've been saying 1.8. Now, it's 1 point -- it’s really kicked in. It's soon going to be 2.4 trillion dollars, okay? That’s like a point, whether you believe in the great economists or not, that seems to be a point of no return. That's where we're Greece on steroids, okay? We're going to be there very soon. Why are we doing all of this? These are wealthy countries. They will give us, if we have the right messenger, they will give us. It's like this horrible deal with Iran. This deal, if you had the right, you'd have the prisoners back years ago. Can you believe that deal? I understand a lot of people are critical of the deal. But could you, what deal can you come up with that wouldn't give Iran money? I would have told them up front, "By the way--"
"We will never give you back your money. We will never--"
--"give you back your $150 billion. You're never getting that money back." That's number one. Number two, "Before we start negotiations, you have to give us our three prisoners." Now, it's four, okay? You know, when it started, it was three. Now, it's four. "You have to give us back. Without question, you have to give them back. "And you know what? You don't want them. But we do. It's psychologically good. And it'll help us make a better deal together. That's good for you." Okay? But I would have told them up front, "You will never get your $150 billion back." They are going to be such a wealthy, such a powerful nation. They are going to have nuclear weapons. They are going to take over parts of the world that you wouldn't believe. And I think it's going to lead to nuclear holocaust. And I will say this. The people that negotiated that deal, namely Kerry and his friends, are incompetent. What do you do on day one though? Let me tell you. But I will police that deal. You know, I've taken over some bad contracts. I buy contracts where people screwed up and they have bad contracts. But you have to abide by it. But I'm really good at looking at a contract and finding things within a contract that even if they're bad. I would police that contract so tough that they don't have a chance. As bad as the contract is, I will be so tough on that contract. It's very hard to say, "We're ripping up." And the problem is by the time I got in there, they will have already received the $150 billion. Do you know if the deal gets rejected they still get the money? Which is something I found out a week ago. I couldn't believe it. If the deal gets rejected, they still get all of this money. Iran is going to be unbelievably powerful and unbelievably rich. And Israel's in big trouble. Israel is in big trouble. Obama has really let Israel down. I think other people will arm with nuclear weapons, yes, based on this deal. Because if you look at it, Iran will end up being nuclear. Even if it's not within the next fairly short period of time. And the whole thing about 24 days. First of all, the 24 days doesn't start immediately. There's a whole big deal before the clock starts ticking, right? So the 24 days could be much longer than that. In 24 days plus numerous weeks, you can do anything. If you get evidence they're working on a nuclear weapon, you order air strikes immediately? --national, Iowa, New Hampshire, everything. If I win, I don't want to really be talking too much about-- Obama talks too much about what he's going to do. "We're going to raid here. We're going to do this." General MacArthur, General Patton, they didn't talk. They got the job done. So that was part one. I've got the panel here. Don't worry, we've got more Trump interview coming up in the show. Jeff Greenfield, former correspondent with CBS News, CNN, and ABC. Now contributes to Politico and The Daily Beast. Molly Ball, politics writer for The Atlantic, Kimberley Strassel, columnist for The Wall Street Journal, and Eugene Robinson, columnist for The Washington Post. The Trump campaign, by the way, has contacted me and said on Planned Parenthood, they couldn't find any evidence that he gave any money for the last 20 years. They wanted me to clarify that. Jeff Greenfield, what'd you learn? First I learned that he's moved to a slightly more subtle level than in the opening rounds. He actually said, "I have to think about that." That's not a sentence that easily comes to Donald Trump's mind. "I'm not sure about that." There was, the first vague hint of nuance, which is another word I don't associate with. I must say that the answer to the question you asked about where he gets his military and his defensive policy stand, you watch his shows. You know, here's the thing. A lot of his supporters do watch a lot of television, right Molly? They seem to. Well, and look, he is capable of seeming to give details while actually being really slippery. So he didn't actually answer a lot of your questions there. He sort of said, "Well, it's this and it's that." And he'll say two contradictory things. But he sort of filibusters in a way that it sounds like he's answering the question at a high level of detail, because he uses a lot of words. Kimberly, did he make the case to conservatives, that he's a conservative? Well, I mean, here's the interesting thing about Trump, is that ever since the debate, you see him. He's now decided he's going to be a real candidate, right? He's putting out some policy details, he's building up his organization in Iowa, he's going to be a candidate. The question is whether or not that doesn't hurt him more in the end with conservatives. If you look at the conservative electorate over the last decade, it's gone through this evolution, the Tea Party change. I mean, what they've decided is that they are generally demanding more principled candidates. And they also want to win. And when you listen to him, it's very hard when you hear the answers to some of these questions. They don't necessarily fall in line with what the conservative electorate has been asking for from candidates over time. It's not just single-payer, but all kinds of things. Gene, if you could, if you had to sum up what you learned about his foreign policy philosophy, did you find, is he an interventionist? Is he an isolationist? What is it? What did you get from it? Well, you know, he's Donald Trump. He's himself. And the selling point of his candidacy is, "I'm Donald Trump." And it's not about his specific policies, and you know, you're right. That was a very weak answer on, "Where do you get your military advice?" But it's really not about where he gets his military advice. It's about, "I can make a better deal. I can go in and take the oil. Don't worry about the details. I'll figure it out. I'm not going to talk a lot about exactly how I'm going to do X or Y because that would be foolish. I don't do that. I know how to make a deal." That's the Donald Trump candidacy. And I actually think he's been very consistent and sort of single-minded about that fact. The central fact of his candidacy. Jeff, you brought up nuance. I thought the most fascinating answer was his Iran answer. That, "I'm going to accept the agreement." And, "I'm going to--" that was a very believable answer to him. "I know how to read a contract. I know how to find loopholes." And that's two things. One, that's another thing that could set some of those conservatives off, because the set line, the default line is, "Rip the deal up" right after I finish swearing missile thing, or whatever. But the other part about that is that you're getting the sense that he's torn. I mean, at one point, he knows that it would be useful to be more reasonable. On the other hand, I think this may be the mantra of the whole campaign here, he's Donald Trump. I keep coming back to what Mark Cuban, his fellow reality said very early in the game, he spotted this, and I sure did, it doesn't matter what he's saying. You're missing the point. But what he said was also very realistic. You tear up the deal on day one, everybody else is following the deal. The Iranians already have the money. It's a very realistic answer. But it also shows a lack of understanding. I mean, he doesn't get to enforce this deal. International nuclear inspectors enforce this deal, so. And that does come through the more you talk about some of these foreign policies. Let me take a break here. We've got more of the Trump interview, a little more domestic issues coming up, including and revealing his first big white paper and it’s just on immigration. Yeah, well, Chuck, you either have a country or we don't have a country. Welcome back. Few things that Donald Trump has said during the campaign has attracted more attention than his negative comments about Mexican immigrants. However, he has been light on detail on how he'd address illegal immigration. Well, yesterday on his plane, he handed me his immigration plan, about an eight-page plan. He wants to end the automatic right of citizenship for anyone born in the country. That's probably the biggest news in the plan. And he plans to immediately rescind President Obama's executive order that stopped the deportations of some younger undocumented immigrants who had entered the country as children. Here's a little bit more from him. You'll rescind that one, too? You're going to have to. So you're going to split up families? Chuck. No, no. We're going to keep the families together. We have to keep the families together. But they have to go. But they have to go. What if they have no place to go? We will work with them. They have to go. Chuck, we either have a country or we don't have a country. The cost of doing it? Look at the cost of what we have right now. But the cost of doing it. I understand that. But how do you it? Do you think there's tremendous cost for the illegals that are in here right now? Of course there's cost to it. Okay, tremendous. Do you think there's tremendous crime being committed by illegals? I know there's definitely evidence that it's happened. There's been some heinous ones. And you see it all over. Just last night. All over. We will do it. And we will expedite it so people can come back in. Chuck, it'll work out so well. You will be so happy. In four years, you're going to be interviewing me and you're going to say, "What a great job you've done, President Trump." Coming up, my lighting round with Donald Trump, including whether he believes President Obama is a U.S. citizen. And then there’s this little nugget: I asked him why he felt it was necessary to constantly remind people that he attended the Wharton School of Finance. Here was his response. Look, if I were a liberal Democrat, people would say I'm the super genius of all time. The super genius of all time. If you're a conservative Republican, you got to fight for your life. It's really an amazing thing. Welcome back. As everyone knows, Donald Trump has a lot of opinions about a lot of things. I did sort of a lightning round on issues with him, starting with his role in the birther movement, questioning President Obama’s citizenship 4 years ago. Let me go through some grab bags. What launched our relationship, shall we say, was back four years ago. Do you believe President Obama is a citizen who was born in the United States? We’re talking about the birth certificate. But here's what I'll do. I'm proud of my records. But he has to do it. If he does it, I'll do it. President Obama tried to put a ban on lobbyists ever working in the administration. Will you do something like that? Well, that's a pretty good idea. Because, you know, these guys get out and they almost immediately go to work for a company. And they have power that they shouldn't have. Look, when Jeb Bush raises $114 million, I know those people that gave him the money. I used to be one of them. I would certainly have a ban. Yeah, you can't put a lifetime ban. But you can certainly make it three, four years. What is a fair living wage? What’s fair? I want to keep the minimum wage pretty much where it is right now. Well, we're not going to be able to compete with the rest of the world. I want to compete with the rest of the world. What I do want to do is bring in jobs so much so that people don't have to live on minimum wage. But we are going to have to compete with the rest of the world. All right. Toss you a quick Facebook question. Michael Martinez asks, "Residents of the District of Columbia currently pay federal taxes but have only a non-voting delegate in the House of Representatives, no representation in the Senate. Should that policy continue as is? Should D.C. become a state? Should it not have to pay taxes? Should it be treated like Puerto Rico--"
“How should D.C. residents be treated--"
It'll open. And, by the way, unlike our government, we're under budget and ahead of schedule. Isn't that a nice thing to hear? You don't hear that. Just like the wall will be under budget and ahead of schedule. And nobody's getting through that wall. Believe me. So I have a little bit of a conflict. I would like to do whatever is good for the District of Columbia because I love the people. You know, it's funny. I've really gotten to know the people, the representatives, and the mayor, and everybody. They're really special people. They're great. And they have a great feeling. So I would say whatever's best for them I'm for. I have a total conflict of interest. When was the last time America was great? I would say during the administration of Ronald Reagan you felt proud to be an American. You felt really proud. I don't think since then to any great extent people were proud. Then let me ask you this. Not trying play a little “gotcha” here. But in 1987 you took out a full-page ad. This is during the Reagan administration. And you said this. "To the American people. For decades, Japan and other nations have been taking advantage of the United States." On message, by the way. It's consistent. "The world is laughing at America's politicians as we protect ships we don't own carrying oil we don't need destined for allies who won't help." Message-wise, very consistent. This was a fiery guy. --difficult. But it's not that. Look, somebody was asking me that question the other day times 50. All right? I mean, I'm hearing it all the time. So just stay, "I'm going to stay as a Republican." Why is that so hard? Because I'm not prepared to close that door yet. But I wouldn't be surprised if someday in the not too distant future it happens. They are treating me very well. I just want to be treated fairly. And, you know, I'm a person that believes in leverage. And it has been for a long time. --there is, you know that some of the criticism that we feel like we’re all part of a reality show? No this is not a reality show. This is the real deal. You did smile when I read the show stuff. Because it resonated with you. Look, my life has been an interesting life. I’ve had a lot of fun. I’m leading in the polls. I go on your show, you will get the highest ratings you’ve had in years. I mean it's one of those things assuming that people know I’m on. I mean, whatever it is. Look at FOX, look what happened to FOX. I mean it’s a whole crazy thing going on and all I care about--and this is 100 percent truthful--I love this country and I want to make it great again. And its not gonna be great if we keep going the way we’re going, we’re going to be third world, we probably already are. You look at our airports, our roads, our bridges, schools, our school system, we’re 25. We spend more on individual students than anybody else. We’re 25 in the world. We have to fix our country. We have to make our country great again. Let me bring back the panel. Molly Ball, one thing I imagine we've got to give him credit for there, which is there is a consistency to his complaints about government, which is trade. There absolutely is. And this has been a long-term consistency, as you know. And I think that, you know, we talk about, is he going to alienate conservatives with this policy, and so on. I don't think his real audience is conservative-based voters. I think his audience is a sort of broader set of alienated, sort of blue-collar people, who are upset with China, upset about trade, upset about immigration. The continuity between the China complaints and the immigration complaints is that there is a feeling that the reason we're losing blue-collar jobs is because of these two factors. And so he appeals to a lot of people who are sort of loosely connected to politics, don't have ideological litmus tests on all of these issues we try to trip him up on. But just want someone who's strong and tough and takes charge with the force of personality. And that is what he offers. Jeff, you and I were talking about this historically, he's a nationalist. And he's in line with other infamous and famous businessmen who've turned to politics and preached nationalism. I would broaden that a little bit. And here's yet another thing that I missed. I'm not sure what I'm doing here with all these misses. But there is a strain in this country of looking at really wealthy people, who are outside of politics, and thinking, "That's the answer." Henry Ford was seriously considered as a possible president. Ross Perot, both Romneys, Nelson Rockefeller, Mike Bloomberg. And the reason is, it’s in that answer about lobbyists, "I can't be bought, and I'm too rich to steal, and all these other people one way or another are groping for money from people who want influence." And that's what he said in that first debate. That and Kimberly, you know, and Molly both, you're exactly right. That's not necessarily conservative appeal at all. It is populist. And when it’s linked to his rhetoric on immigration and the birtherism of three years ago, that is another long and fairly ignorable tradition in American life, going back to the Know-Nothings of the 19th century. That's an interesting group. But it's not just the money thing. It's the outsider question. I mean, look who else did well in that poll, you had Carly Fiorina, you've got Ben Carson, the Americans out there are just very unhappy in general with Washington. They want someone who is outside of that perspective. Go back, by the way, to 2011 at this time, who was heading in the polls? Herman Cain. Which is what a lot of people always want to say. And they say, "Then you should dismiss it." Well, I'm not saying they should dismiss it, because he has tapped into things that do matter. You know, the immigration thing, the things that he's proposing, that he proposed to you, are not going to fix the immigration problem. But he has identified some real anger out there. And you see the other Republicans realizing that they've got to address it too. And that has had an influence on the race. By the way, he worked with Senator Jeff Sessions, his office, that's who they used for this and who has been probably the hardest-line immigration activist in the Senate. Go ahead. CHUCK TODD:He’s oddly authentic about it. Right. This is all kind of a game. They're all telling you this because this is what you want to hear. Let me show you how it really works. Well, I'll tell you, and by the way, there's a lot more to the interview. We talked NATO, we talked what would happen if Saudi Arabia erupted into a civil war, a lot more you're going to want to see. Check it out on our website, of course. And by the way, we have his plan, his new immigration plan. It's already up on the website as well, a little more detail there. When we come back, we're going to change things up a little bit, talk about the Democrats. Hillary Clinton's growing troubles have led to the rise of this man, Senator Bernie Sanders. The Vermont senator joins me next. Welcome back. To understand what's going on in the Democratic primary, you have to sample the mood on the ground. And from my three days in Iowa, it's clear to me that the Bernie Sanders phenomenon is very real with the Vermont independent senator attracting huge crowds. Senator Sanders joins me now from Iowa. Senator, welcome back to Meet the Press. I have to say, I was both in Clear Lake, watched you there, watched you on the soapbox yesterday where you had so many people. The fair has stopped, forget Trump, forget Hillary Clinton, I think you might have had the biggest crowd yesterday. Why do you think you're resonating at this point? And how do you take this from being a movement that seems big in August, and how do you keep it from fading five months from now? Well, Chuck, I think we are resonating all over this country and here in Iowa, because we're talking about issues that are life-and-death issues to the American people. And that is the collapse of the American middle class, the massive and grotesque level of income and wealth inequality in this country, the fact that we are the only major country on earth that doesn't guarantee healthcare to all people, the fact that millions of working-class families are now finding it very, very difficult to send their kids to college. And the basic fact that people are working longer hours for lower wages, and meanwhile, almost all of the new incoming wealth is going to the top 1%. And then you add to that a campaign finance system as a result of Citizens United, that allows billionaire families like the Koch brothers and others, to literally buy politicians and corrupt the American political process. You add all of that together, and the American people are saying, "Enough is enough." You know, the last time I had you on, and I asked you about what do you think of the comparisons between the phenomenon of what's been happening with you, and whether there were similarities with Trump, you were dismissive of it. But can I tell you, I can't tell you how many people came up to me and said both positive things about you and Trump at the same time. Using things like the campaign money example and the outsider. What do you think you have in common with the Trump voter? Forget Trump, but the Trump voter. Well, yeah, but here's the difference. You know, I am not a billionaire. My family doesn't have a whole lot of money. We are raising our campaign contributions from 350,000 people who are contributing, Chuck, on average, $31.20 apiece. That's our response. To go out to working-class people, to go out to the middle-class people, and getting support. I think that's a little bit different approach than Donald Trump's. Buzzfeed has an article out this morning. Headline is this: "Sanders Campaign Reaches Out to Black Lives Matter Activists." Quote, "I apologize it took our campaign so long." Tell me more about it. Well, that was sent out by a staffer, not by me. Look, we are reaching out to all kinds of groups, absolutely. I met with folks at Black Lives Matter, we're reaching out to Latino groups, we're reaching out to the unions, we're fighting to expand social security, and we're reaching out to senior groups, we're reaching out to healthcare groups, because we believe that everybody in America is entitled to healthcare. We're reaching out to everybody. But on this issue of Black Lives Matter, let me be very clear. The issue that they are raising is a very, very important issue. And there is no candidate for president who would be stronger in fighting against institutional racism, and by the way, reforming a broken criminal justice system. Chuck, we have more people in jail in the United States of America than any other country on earth. And we need real changes. We need to do away with the militarization of local police departments, we need to do away with minimum sentencing, we need education and jobs for our young people, rather than jails and incarcerations. I understand that but, you said a staffer put it out, but you felt an apology was necessary? No, I don't. I think we're going to be working with all groups. This was sent out without my knowledge. Fair enough. Let me ask you something that Martin O'Malley said, clearly was a reference to you earlier this week: "I don't think it's a problem for the Democratic party, but it might be a problem long-term for Senator Sanders. I am a lifelong Democrat and I believe very deeply in the principles of our party, that's why I choose to be a Democrat, not just in presidential years, but every year of my life." This reference that you have not become a registered member of the Democratic party. What do you say in response? Well, legally in the state of Vermont, you can't, you know, legally become a member. You vote in the Democratic primary, I have done that, I have supported and helped Democratic candidates for a governor in my state. I have been a member of the Democratic caucus. After 25 years in the House and the Senate, I'm now the ranking member of the budget committee. But it is true, I am the longest-serving independent in the history of the United States Congress. And let me tell you this. I think it is an advantage. Because when I speak to 28,000 people in Portland, Oregon, and 27,000 people in Los Angeles, the vast majority of those people, they're not, quote, unquote, "registered Democrats." They are ordinary people who are sick and tired of politics as usual. And by the way, one of the real advantages, I think, of me winning the Democratic primary, is that we can get a lot of young people, a lot of working people involved in the political process, getting them out to vote in a way that establishment politicians can't. Democrats are losing because voter turnout is abysmal. I think we can change that. Very quickly, one of your largest applause is when you said when you become president, you're going to focus on creating a healthcare system that's essentially Medicare for all. Does that mean you're going to trap the Affordable Care Act, and then try to implement Medicare for all, if you're president? Well, Chuck, what it means, is we are, as you know, the only major country on earth that doesn't guarantee health care to all people. I live 100 miles away from Canada, they do it. We spend almost twice as much per capita on our health care as do the people of any other country. So what we want to do is expand on Medicare. Medicare is a popular, good system, it covers people who are old, I want to see Medicare cover everybody. A Medicare for all, single-payer program, is the way, in my view, that you provide universal, quality, cost-effective healthcare, and we join the rest of the industrialized world. All right, last question, Joe Biden, do you welcome him into the race? Do you think he should run? I have known Joe for many, many years. And everybody who knows Joe likes him and respects him. The decision as to whether or not he runs is his. If he does run, I promise him an issue-oriented campaign. We'll debate the major issues facing the American people. Help your campaign or hurt? We'll let the political pundits determine that. All right, Senator Bernie Sanders, I look forward to a longer, extended, issue-oriented interview at some point where we can do the gambit of issues, including some foreign policy in the near future, sir. I'd love to do it. Thank you. When we come back, we meet the voters in Iowa. Wait till you see what Democrats are saying about Hillary Clinton's growing trouble. But before we go to break, we want to talk about some sad news this morning. Julian Bond, a key figure in the civil rights movement, has died at the age of seventy-five at his home in Florida. In an appearance on this program in January 1966, Bond, who had been just barred from taking his seat in the Georgia House of Representatives, came on Meet the Press and said this: his case was a clear example of why the U.S. government still had to do more to protect civil rights. And certainly the right to free speech, the right to dissent, the right to voice an opinion that may be unpopular, but I think a second and equally as important issue, is the right of people, in this case my constituents, to be represented by someone they chose. You know, if it weren't for Donald Trump, Hillary Clinton's struggle to maintain control and Bernie Sanders' rise would be probably the biggest news of the summer. As 2016 candidates descend on Iowa for food on a stick, and more than a little campaigning, there are growing concerns among Democrats about Hillary Clinton's campaign. And it is producing whispers that Vice President Biden or even former Vice President Gore, you pick the big-name Democrat, should jump into the race. Well, I spent part of the weekend talking to Democrats at the Iowa State Fair. And you won't believe what they're thinking. In 2008, I supported her because she's a female and she seemed to relate to us. But now, she seems elite, and I don't want another Clinton and I don't want another Bush. --there are rising doubts about Hillary Clinton's campaign among Democrats. What concerns you about Hillary Clinton? Right now, that something is the drip, drip, drip of questions about Clinton's State Department emails, and allegations that classified information was mishandled on her private server. This weekend, Clinton attempted to joke about her new account on SnapChat. Those messages disappear all by themselves. Then she fiercely defended herself to Iowa Democrats. It's not about emails or servers either. It's about politics. I've just provided my server to the Justice Department. But here's what I won't do. I won't get down in the mud with them. And then shrugged off questions from reporters. This is the usual partisanization, which I may have just made up a word, of anything that goes on. It's not anything that people talk to me about as I travel around the country. But some Democrats I talked to are concerned about how the campaign has handled this controversy. It does seem to me a little bit like she's hiding something. You feel like she owes you a better explanation? Absolutely. We're smarter than that. Voter frustration with political insiders is apparent. 61% of Iowa voters say they've had enough Clintons and Bushes. That includes many Democrats. And these folks are giving Bernie Sanders a long look. It's nice to kind of have an outsider. Though he's been in politics for a long time, it's nice to have somebody who's not a Clinton or a Bush. We’re now down to rumors of Gore jumping in. You think that’s about her? It’s gotta. It’s gotta sting. For now, Biden appears more serious than Gore. In fact, one source tells me it's more like 60-40 that he will run. Meanwhile, Clinton sent a not-so-subtle signal to Gore and Biden that it might be too late to get in. She walked the state fair side by side with popular Iowa Democrat, Tom Harkin, who endorsed her Friday. Hillary is doing everything right. A much better and I think more personally involved, if I might say that, campaign this year than it was in 2008. Let me bring back the panel, interesting backhanded compliment there by Tom Harkin, Gene Robinson. How about that? To that room full of activist Democrats. But it's hard to claim this is all just a partisan witch hunt when the Justice Department, under a Democratic administration, is looking into the whole email mess. So that doesn't ring so true. And it is not going to have an impact on people the way she wants it to. And clearly, a lot of Democrats are worried. I was stunned at how easy it was to find these Democrats willing to say these things. That was on camera. Molly Ball, this morning’s Washington Post, blind-quote central from Democratic handwringers, a lot of people who were hired by the campaign were new to the Clintons. I kind of assumed it would be different, but it hasn't changed. Another strategist, "I don't think there's a big smoking gun, but it's hard to explain why you had a private server, why you just now turned it over. Shouldn't you have had better judgment?" Well, and the fact that this story has not gone away has really worried a lot of people in the inner circle. And you do have this tension within the campaign. You have this sort of Obama veterans who like to take the long view. They believe that this is a long game and that you wait it out and that you don't get caught up in the politics of the moment and in the process. But that's not the Clinton people's view. And they want to fight on everything. And they get very nervous when there is all of this discussion. And so, you know, then it turns into an organizational mess, which is what bogged down her campaign in 2008. And it's going to be the insiders, it's all the different people in her ear, and her inability to mediate those disputes. Let me read you Jennifer Palmieri, the campaign communications director, sent this to The Washington Post on this article, she says, "The bottom line is this kind of nonsense comes with the territory of running for president. We know it, Hillary knows it, and we expect it to continue from now until election day. It's okay, we'll be ready. We have the facts, our principles on our side." Is it enough? I'm glad you mentioned Ms. Palmieri, because one of her statements about the email issue just brought me up short. She said, "Well, you know what? Four of the governors running for president of the Republican party, they also had private servers." And I'm thinking, "Did they deal with classified material, with C.I.A. matters?" So I think the entire press corps, by the way, should switch to decaf, because everything's over caffeinated. I've got to tell you, I got caught. All right. Kimberly, let me get your take on this, but let me sneak in a commercial. We'll get your take after the break. We're going to be back in a moment. The end game segment, and a question, by the way, at the end of it, how high can you get your cholesterol count in one day at the Iowa State Fair? I’ll prove it. And I also have some new polls right after the break. All right, end game time. And of course the panel is back. And before I go, I've got some new poll numbers I want to tell you on the Republican race. But Kimberly, I want to ask you about the Hillary email situation, the potential for Biden jumping in. Is this a good thing for the Republican party? Or do you think actually this is going to help the Democrats get their own enthusiasm in gear? Look, I think it would be good for the Democratic party to have a good debate. I mean, Hillary Clinton has made it sound for years that she is the only thing that they've got. She is invincible. And I think one of the good things about all of this discussion is that maybe it will inspire a little bit of debate. And yeah, it probably will for the Republicans, it will be good for the Democrats to have a little bit of debate on their side. Well, it will liven things up. Let me first, Fox News just came out with a poll, we gave you that sort of poll last week telling you, and a lot of people were surprised about Carson and Cruz moving up in that poll we showed you last week. Well, look it here, there's a new Fox News poll this morning out. Trump at 25, Carson and Cruz at 12 and ten. Jeb Bush falling down to nine, Huckabee, Walker. I'm not going to let Jeff whine about polling here for a second. I'm kidding. But there is a pattern here, Gene. The outsiders have moved up in that debate. We said, all of us smart pundits said Rubio and Kasich did the best. They didn't make the top six. Actually, there's a pundit here, not necessarily so smart, but he said Trump did well and he said Carson was going to move up. Add all that up, that's right. --all the outsiders together, you're getting to a huge chunk of the Republican party. Here's my favorite line of the week, Jeff Greenfield. Ezra Klein was writing about Bernie Sanders, but he had this line. "People get more pragmatic the closer they get to an actual vote." This is an issue that Carson's going to have to deal with, Trump, Sanders, all of those folks. You know, the Carson entrail though is-- never mind. Yes, it tells us something about where people are thinking now. A snapshot of the football field at 11:00 in the morning. Kevin Neal on Saturday Night Live, "Recent poll, 80% of the people said if the election were held today, they'd really be surprised." We should all keep that in mind. All good, Molly Ball, there is a part of this that feels like the August silly season, okay? We're talking about new candidates jumping in, the rise of Donald Trump, Kimberly brought it up earlier. At this point in time, it was Bachmann who had just won the straw poll, Tim Pawlenty had just dropped out, Michele Bachmann didn't even make it to Iowa. Because this is very troubling for a lot of people who thought they understood the process. The other thing we learned from that poll is that Donald Trump really is the Teflon Don, that nothing can take him down. That none of these controversies that people think are finally going to show America that he's not fit to serve, it never affects him, because that's how angry people are. And I think the possibility that maybe what happens in August doesn't stay in August this time. Or maybe that anger is so out of control, that it actually keeps going to the caucuses. That's what people are afraid of. That's my hunch at this point. Alright, before we go, I did come back from the Iowa State Fair, and I was on a mission. How much fried food, fair food, could you buy with a budget of 50 bucks? Well, here's the answer. Way too much. Take a look. Pork chop on a stick? This is really good actually. I love, the corn dog. Apple pie on a stick? Bacon? The answer is yes. The mac and cheese and the lemonade. That "oh my God" was not a good "oh my God.” I promise you that was--the new habit, Gene, is apparently no matter what it is, put bacon on it. The apple pie on a stick, they put bacon on it. You say this like it’s a bad thing. Talk about taking one for the team. But seriously, the bacon thing is great. I know, we're all into savory, this whole foodie nation is bacon on everything. I don't know. I know we love bacon. Anyway that's all for today. Fair enough. That's all for today. 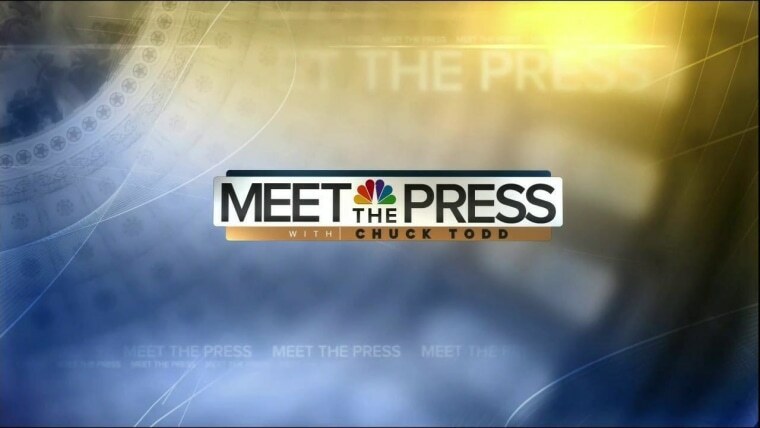 We'll be back next week, because if it's Sunday, it's Meet the Press.